I survived the wedding festivities and have only to show you all now how lovely my young niece was. My niece the doktah. She's a tiny thing, barely over five feet tall. She had not one single bridezilla moment, but took everything completely in stride, with that 1,000-watt smile going the whole time. There was a terrific Irish band and lots of singing and dancing of jigs. My sister lost (!!) 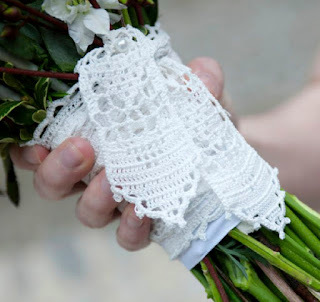 the first ribbon I crocheted for the bride's bouquet, but I made another and brought it with me. The lost one resurfaced today. I figure now my niece has two, which is a good start on a christening outfit. 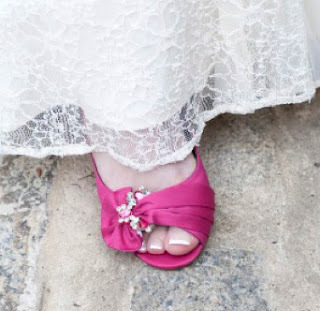 Oh, yes, I guess there was a groom, too. That's him on the right, his older brother on the left, and my father's longtime physics colleague between them. The groom's family were as charming a group of Irishmen as you'd ever hope to meet, and very fine dancers and toast-givers. Once upon a time, the CIA used to wage cultural and psychological warfare against communists and other baleful influences. Of course, so did their foes: the USSR had a far more expansive program than is commonly known. They had the insight to fund, not poetry reviews or high-culture magazines, but straight news: and to arrange to provide that news for free in third world countries. I guess the USSR method has been the more enduring, although it has passed from governments to interstate actors. This woman has an excellent grasp of the strategic situation. My sense is that the response to shutting down Catholic hospitals, etc., will be for the government to sigh pitiably and say, "Well, that just goes to show why something as important as hospitals/schools/adoption services can only be entrusted to the government." That's what they wanted anyway: government to have unquestioned and unlimited authority over this sphere of life. On the other hand, defiance of the law -- justified because it is a gross violation of the principle of religious freedom, and remains so regardless of the decision of the courts -- forces the government to shut you down. Let the people see armed Federal agents shutting down hospices and nunneries and orphanages. Let the people see that the principle of free birth control and abortion is worth that much to the government. A hostile kangaroo launched a savage assault on a mother after spending two days stalking her - then attacked her husband as she recovered in hospital. Now that's an interesting concept, being stalked by a kangaroo. Have they finally gotten rid of all the rifles in Australia, then? Mentioned in our recent discussion of A Clockwork Orange, B. F. Skinner is one of the least-beloved figures of modern history. A new article argues that we've got him all wrong. [His study] turned out to be the crowded basement sanctum of an inveterate tinkerer and gadget guy. Lacking WiFi and Bluetooth in his office, Skinner had jury-rigged strings and all sorts of wooden and cardboard doodads that enabled him to tweak his environment from his desk chair: by hiding the face of a clock he found himself watching, or by turning on a tape recorder that inspired him to organize his thoughts. Though more advanced in execution, today’s electronic nudges and tweaks are identical in purpose: use what you can control to affect what you can’t. The simple elegance of this concept flips on its head Chomsky’s suggestion that behavior modification treats people as if they were no more intelligent than animals. What distinguishes our intellect from animals’ is not that we can go against our environment—most of us can’t, not in the long run—but rather that we can purposefully alter our environment to shape our behavior in ways we choose. Pause and consider; and then we can discuss. One thing about history. There's always more of it. You may remember this clever political theory from 2008. The Bugs-Daffy frame is another way of saying that ever since the dawn of television put the public personalities of candidates front and center, the one who is more comfortable in his or her own skin always prevails against the more uptight, rigid foe. The model has a lot to offer, when you have candidates who basically fit the models. Romney, whatever else he is, is not much like Daffy Duck. No, I think another rule of Warner Brothers applies to this race: "The Turtle Always Wins." On occasions like this, I always feel like it is impossible to say what needs to be said. I am always afraid of leaving unsaid the most important thing, through lack of wit; and my wits are worse this year, for illness and lack of sleep. So I will trust to music to say what I cannot think to say, and to the judgment of trusted companions. That last one's not just music, but it's got good history and a pretty solid time-on-target airstrike at the end. That last hit was a little late, but the rest of them are inside the three-second standard. [Ann Romney's dressage trainer] Mr. Ebeling was at ease with the wealthy women drawn to the sport of dressage, in which horses costing up to seven figures execute pirouettes and other dancelike moves for riders wearing tails and top hats. Well, OK, "up to." Remember those posts about the Dawsonville Pool Room from a little while back? Well, just down the road is Unicorn Valley Farm, run by a nice lady named Carol. She has horses to sell from around eight hundred bucks up to a few thousand, and will break and train them six days a week for you for $720 a month. If you can't afford a horse but still want to learn, she'll cheaply lease you time on one who knows dressage already. If you do that, or if you already own a horse who knows, the price for human beginners is forty bucks a month. For all of these prices, if you don't have that much money but you or your kids know how to shovel out a horse stall, there's a discount. She used to sponsor the equine club for the local high school, until the recession hurt her enough that she couldn't afford to give that much time and money to charity any more. Even so, I can promise you that there are a lot of poor girls from Dawson County who know more about dressage than Ann Romney. Nothing against Mrs. Romney: but I've seen some of them ride. Today is the day to swear again the old oath. [Arthur] charged them never to do outrage nor murder, and always to flee treason; and to give mercy unto him that asked mercy, upon pain of forfeit of their worship and the lordship of king Arthur; and always to do ladies, damsels, and gentlewomen and widows service, to strengthen them in their rights, and never to force them, upon pain of death. Also, that no man fight a duel they knew was wrong, neither for love nor for worldly gain. So unto this were all knights sworn who were of the Table Round, both old and young. "And every yere so were the[y] swome at the high feste of Pentecoste." Pentecost was the day when the Grail Quest began, which destroyed the might of the Round Table. The Grail visited Arthur's table at the feast, and then passed away again. Instead of accepting the grace offered, they quested after it as if they could win it by their own valor and worthiness, and so were destroyed. Pentecost is the right day for that message. Before the time of the apostles it had been the feast of firstfruits. If early spring represents the return of fertility, early summer allows us to see the first children that come of that renewed fertility. It is the first nourishment that comes to us after the winter. There remains a long summer ahead before the full harvest -- summer was the hungry time, in the middle ages. Yet here is a first taste of grace, and a promise of greater grace to come. Arthur did not go on the quest for the Grail, but stayed true to his duty to keep the walls of this world. And then they put on their helms and departed, and recommended them all wholly unto the queen; and there was weeping and great sorrow. Then the queen departed into her chamber and held her, so that no man should perceive her great sorrows. 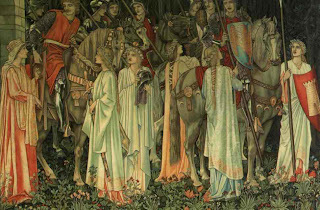 When Sir Launcelot missed the queen he went till her chamber, and when she saw him she cried aloud: O Launcelot, Launcelot, ye have betrayed me and put me to the death, for to leave thus my lord. It is a grave question that troubles me every year: is it right to go on the quest, or is it not? Lancelot holds that it is better to die in that quest than in any other fashion. Death is sure to us all, but the suffering of the quest prepares and purifies the spirit, so that it might be a little less unfit for the presence of God. Arthur holds to his duty to keep the space in this world in which joy is possible, and trust in the coming of the later grace. 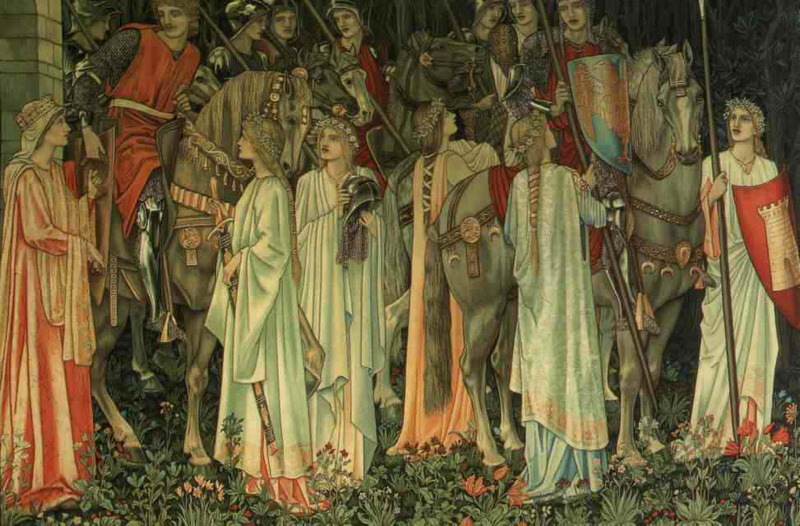 So he held Camelot, and the peace of the land and the people, while his knights broke themselves in the wilderness. A Smithsonian article traces the 10,000-year-old domestication of these descendants of the dinosaurs by their upstart rivals, the mammals. Modern chickens probably sprang from a northeast Indian red junglefowl, but there may have been a yellow-skinned gray-feathered relative from southern India in the woodpile as well. By 2,000 B.C., chickens had spread to Mesopotamia. Homer does not mention them, but chickens became quite popular with the later Greeks and Romans, who appreciated the handiness of an animal whose slaughter produced just enough meat for a moderate household for a day. Polynesian seafarers may have introduced them to South America in pre-Columbian times. Today, Americans alone eat nine billion chickens a year, while KFC has opened more than 3,000 outlets in mainland China in just the last 25 years. From Santeria to Jewish mothers to General Tso, this article is encyclopedic. And now I'm inspired to enjoy some of my husband's superb fried chicken, left over from last night, for Sunday dinner. Tomorrow, I hit the road for Philadelphia, there to attend my niece's wedding. 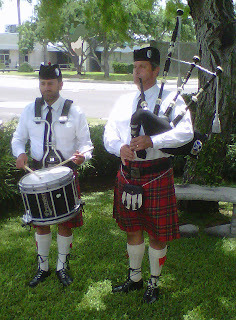 These pipers are not from a military service but from the intimate, traditional, and highly satisfying memorial service we gave to honor my aunt on Friday. Still, they seem an appropriate image for this weekend. Like Grim, I have been ailing significantly (I hope he doesn't have the ugly bug I caught), and am just now creeping out among the living after a week of needing an hour's nap to recover from every ten minutes spent vertical. I'm getting old. The obituary notices of my contemporaries, or even their children, are starting to come with astounding regularity, another just this weekend. A Memorial weekend indeed. 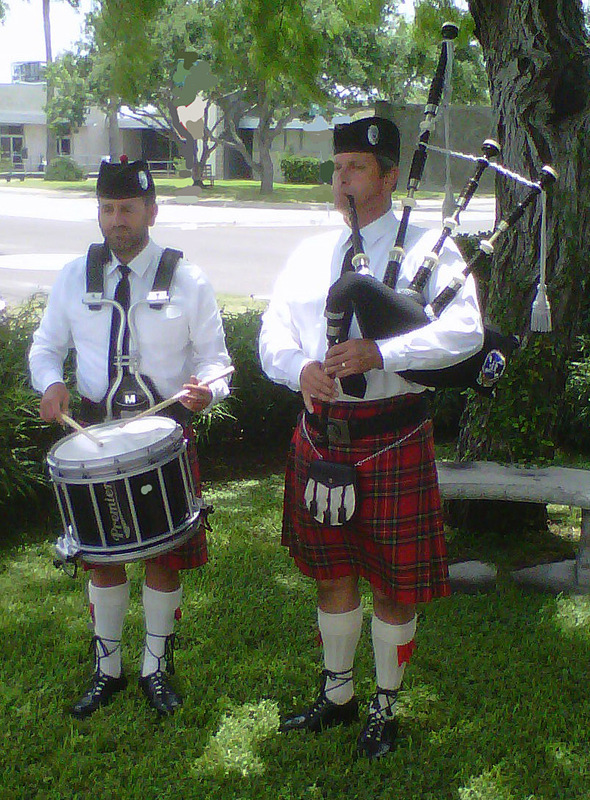 There's nothing like pipes at a funeral. The snare drum was an indispensable addition as well. We stuck to the King James version of the service, not only to suit my stodgy tastes but in honor of my old-fashioned aunt, who was born in 1915 and never really got used to the modernized Book of Common Prayer. Doris Elizabeth Kilpatrick Watts, R.I.P.